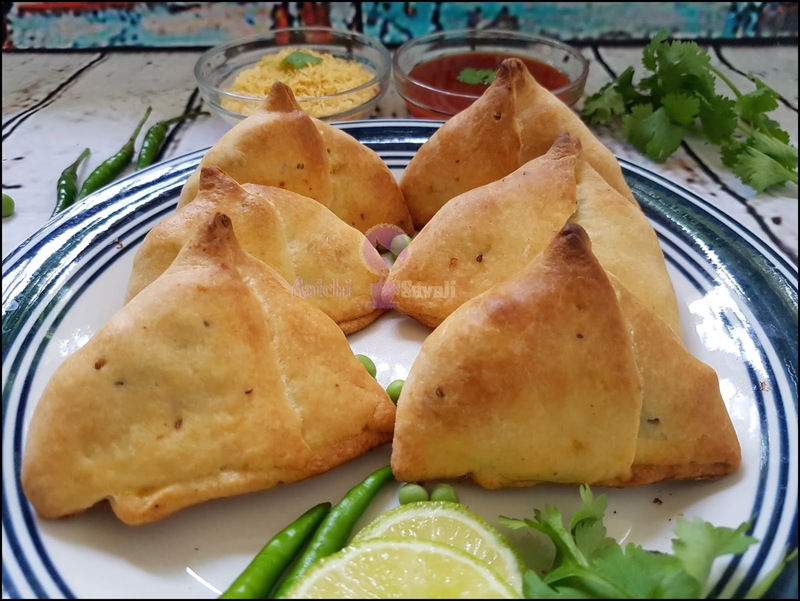 Samosa is a crispy, tangy and tasty famous Indian street side snack or appetizer. To make it low calorie snack, I have baked it. 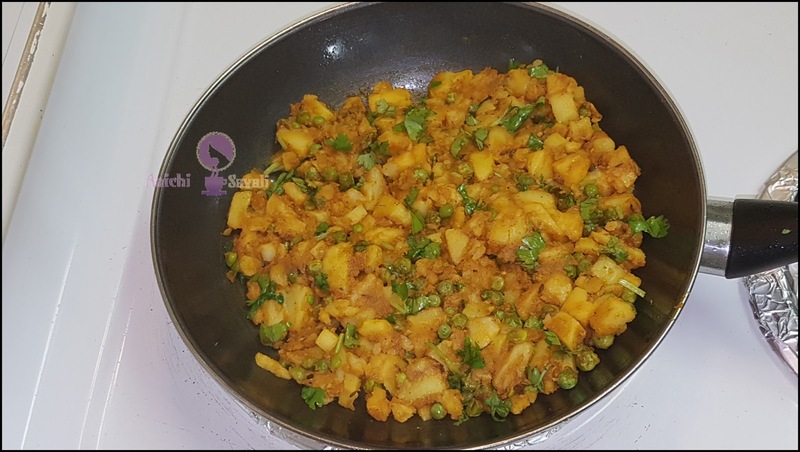 Samosa is a baked snack recipe with a savoury filling of spiced potato, green peas. To instill a little crispiness i have added ghee to the dough. Samosas are usually vegetarian, and often accompanied by a tamarind chutney or tomato sauce. 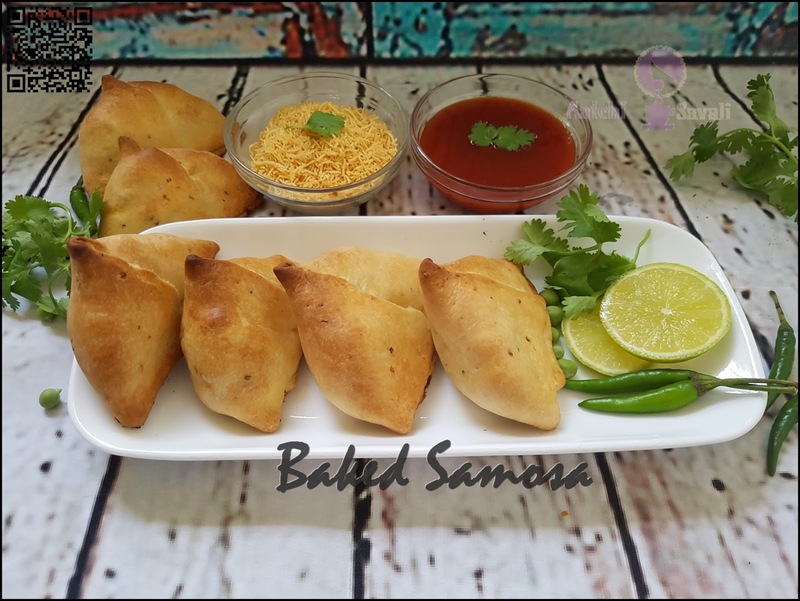 Baked samosa is one of healthy version. Give it a try! Preparation Time : 20 Minutes ; Baking Time : 20 Minutes. 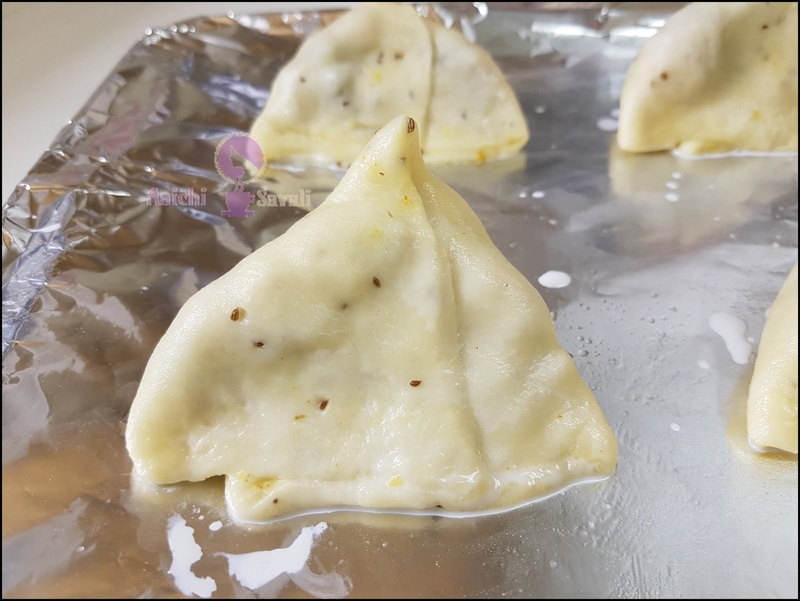 Each Samosa carries 116.9 cal. 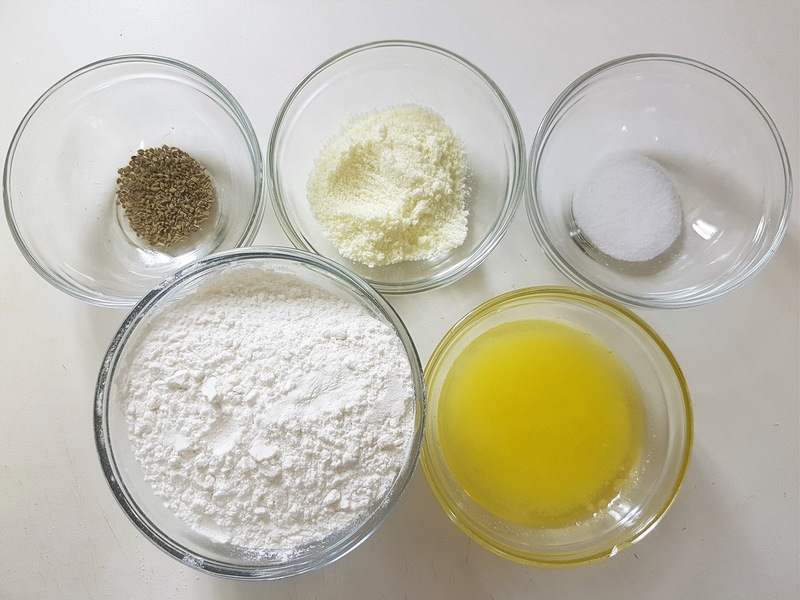 Combine all the ingredients (all purpose flour, ghee, salt, milk powder and carom seeds) together in a bowl and add enough water to make a firm dough. Keep aside covered for 15 minutes. Knead again using oil till smooth. Keep aside covered with a wet muslin cloth. Heat the oil in a pan and add the cumin seeds. When the seeds crackle, add the potatoes and sauté for 2 minutes. Add the ginger-garlic paste, salt, dry mango powder, chilli powder, coriander powder, garam masala, turmeric powder and coriander leaves mix well and sauté for another 2 minutes. Cool completely and divide the stuffing into equal portions. 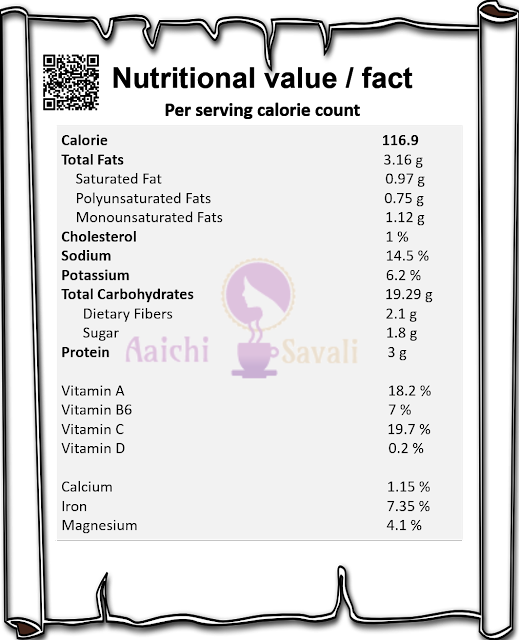 Divide the dough into equal portions and roll out each portion into 6 inch diameter thin chapatis. Divide each chapati into 2 halves, make a cone from each half. Stuff each cone with about 2 tbsp of stuffing and seal the edges of samosa(make a plate as shown in video). 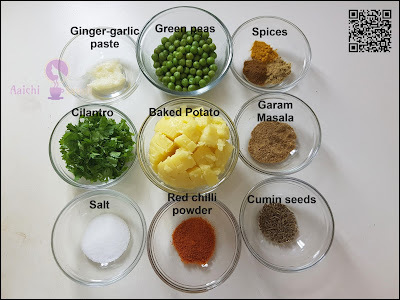 Repeat the same procedure to make the remaining samosas. 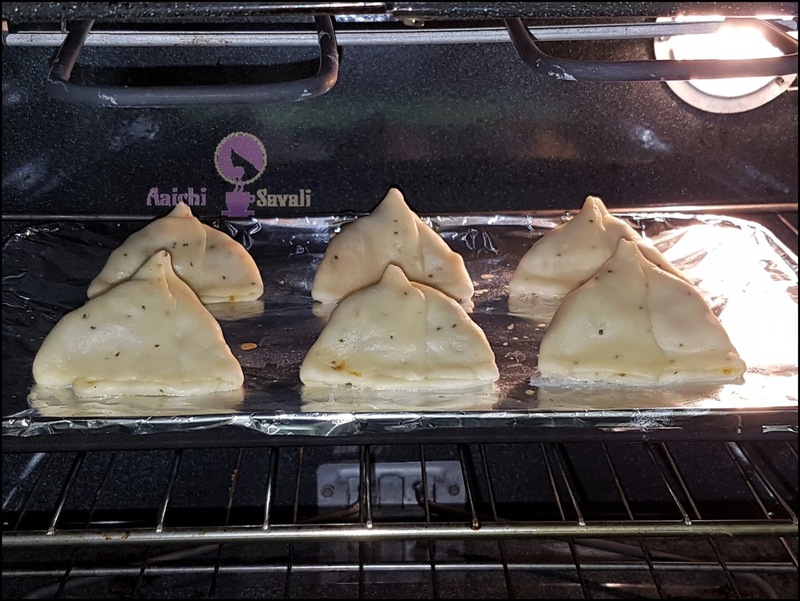 Place samosas on a greased baking tray and bake in a pre-heated oven at 375°F for 20 to 25 minutes. Serve hot with tamarind chutney and tomato sauce. Enjoy! Per serving contains 116.9 calories, along with carbohydrates - 19.29 g, dietary fibers - 2.1 g, fats - 3.16 g, proteins - 3 g. As it is good source of vitamins and minerals, it contains Vit.A - 18.2 %, Vit.C - 19.7 %, Iron - 7.35 %. It's good to it baked samosas as a evening snack. Thank you Nikitha. Yes it is mouth watering and healthy version of samosas.